Whitewater Team members included Front L-R: Dante Baker, Reece Condon, Connor Friend, Back: TJ Piper, Keenan Sheffield, Julian Cohen. Each of these students successfully solved cards and added to our team’s success. 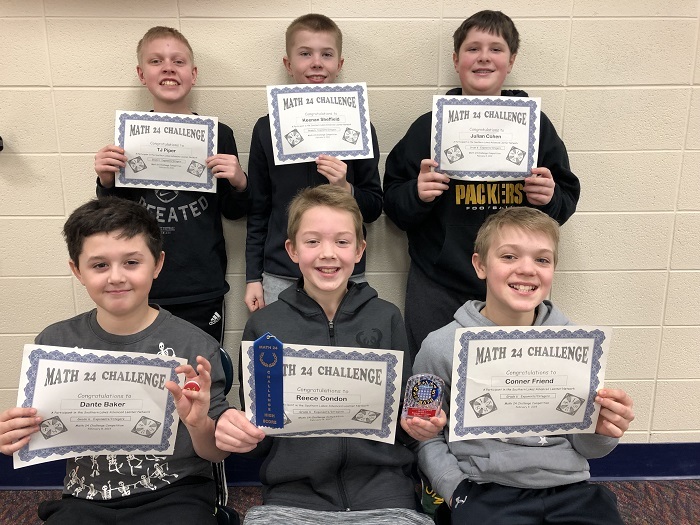 Congratulations to the 6th grade Whitewater Middle School Math 24 team for doing a great job at the Math 24 Meet held on Feb. 8. Special congratulations go out to Reece Condon for winning the sixth place individual trophy. Jefferson students worked extra hard again this year and earned the first, second, fourth and fifth place trophies. The third place individual trophy went to a student from Edgerton. Overall, our school placed second among all four schools competing. Jefferson came in first place. Whitewater students came in second followed closely by Edgerton and then Waterloo. Great effort everyone!